Styled with lilian blouse and landry pant . Very nice and soft cardigan! The oversized look is perfect and exactly what I was looking for. Took off one star because it sheds everywhere, other than that, it is a perfect cute cardigan. It’s definitly oversized...but not in the length. Very oversized torso, and arms. 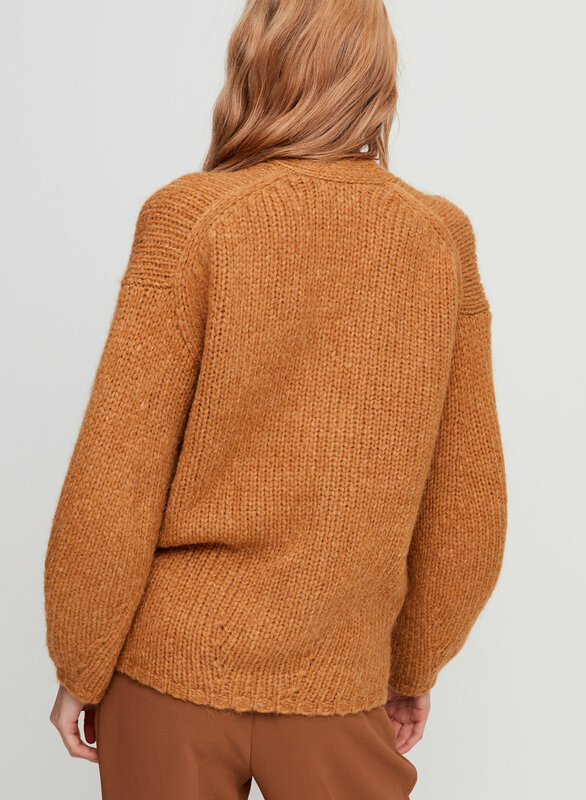 I’m 5’9 and it doesn’t cover my bottom, which wouldn’t be a huge deal but the knit has an obvious reduction pattern that kind of darts in, and should clearly be below your bum. So one star off. However, the softness and the perfect v-neck make up for it, and I wear it all the time. Saw this sweater on a mannequin in store and tried it on because the balloon sleeves were quite lovely. The texture is soft but the Heather Winter White colour does shed a bit, be careful on your choice of bottoms. I'll be wearing my sweater carefully, it looks like it'll be prone to snagging. Bought the S because the cardigan on the model was the only one in store, it's oversized but not unpleasantly so. Lovely colour Rose. Warm & light. Bought large, quite roomy. As I am short 5ft. Anyone taller would probably want it longer in sleeves & length. I bought a second one in grey.My daughters saw it & wanted to buy one. Soft, beautiful burnt mustard colour and a really nice shape. 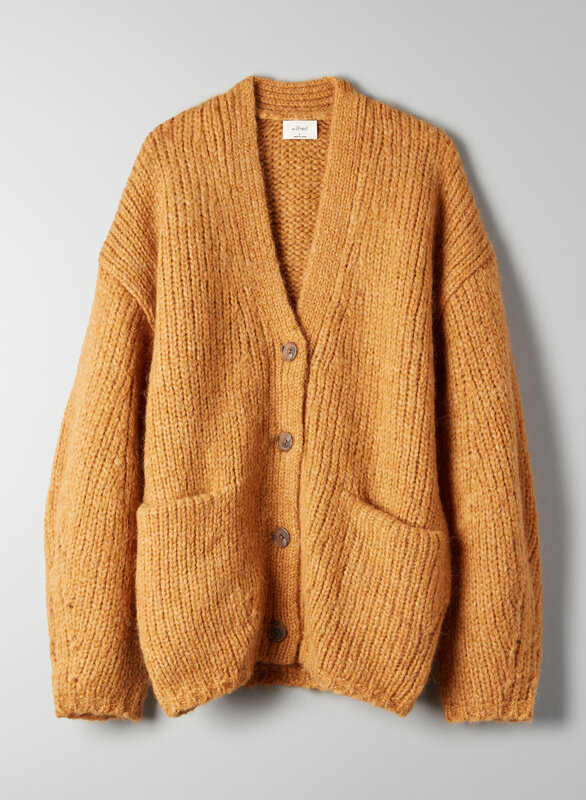 I got this a couple weeks ago and while I like it a lot (the oversized fit, the thickness of the sweater, the color, the knit) it does shed (so don't wear a dark shirt under a light colored cardigan) and it pills quite a bit, which is very disappointing for the price I paid. The sleeves and part of the body are very pilly already even though I've only worn it like 5-6 times. I tried to remedy this with a sweater shaver but not much luck. I bought the fog lilac one. The colour is so beautiful. It’s warm and cozy. It has a weird fit, loose but the length is awkwardly short for an oversized cardigan. Biggest issue: the fuzz from the material instantly attached to everything it touches! Now im gonna get another color! A forever piece! Love this cardigan! Obsessed with this sweater. So warm and cozy. Cute with a tee or silk tank underneath. Love this sweater! Feels so soft and I can easily throw it over any top I own. This is such a great sweater. It’s a relaxed fit but also shapely. I love the detailing on the arms of it. It’s very flattering, and you can never go wrong with any of the classic colors it comes in!